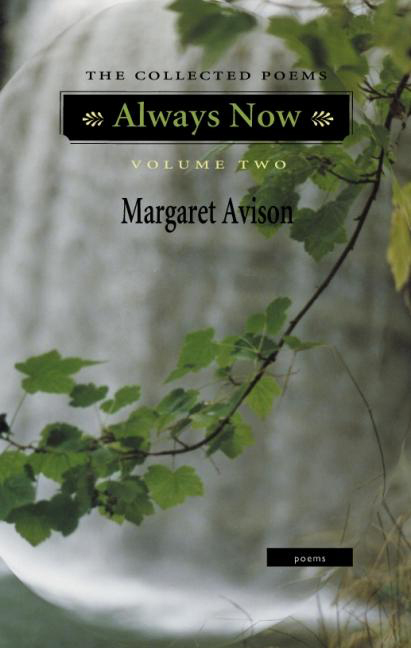 Always Now: Collected Poems of Margaret Avison, encompasses in three volumes all of the published books, from Winter Sun (1960) to Concrete and Wild Carrot (2002), and is framed by a gathering of uncollected and new poems respectively. When complete, Always Now will present all of the poems, up to 2002, that Margaret Avison wishes to preserve. sunblue and No Time, the two books collected here, are growth rings; the poems are rings within rings of reflection on the creation and the Creator. In these poems, Margaret Avison’s faith, now constant, is dynamic, challenging her as well as her reader (‘from the namby-pams / of the cloaking faith I wear / deliver me’). ‘From the serene, leaf-fringed branch on its cover, Always Now may not seem like a book that provides a seismic shock to expectations. But the surprise of reading Margaret Avison’s poetry is, in large part, predicated on the extent to which we have underestimated it. 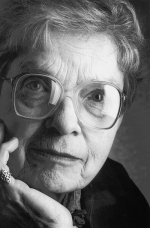 Awarding her poems with canonical respectability has allowed us to tune out everything that is disquieting about them. -- from Margaret Avison’s foreword to Always Now, Volume One. The three volumes of Always Now contain all of Margaret Avison’s published books of poetry. The author has removed a very few poems: ‘Public Address’ (from Winter Sun), ‘The Two Selves’ and ‘In Eporphyrial Harness’ (from The Dumbfounding), ‘Highway in April’, ‘The Evader’s Meditation’, and ‘Until Christmas’ (from sunblue), ‘Living the Shadow’, ‘Insomnia’ and ‘Beginning Praise’ (from No Time), ‘Having Stopped Smoking’ and ‘Point of Entry’ (from Selected Poems). The opening section of volume one, ‘From Elsewhere’, is arranged according to date of publication, from 1932 to 1991, the date of Selected Poems. ‘From Elsewhere’ includes the ‘Uncollected’ and ‘New Poems’ of that book, except for the two noted above and ‘The Butterfly’, which is here in its original form. All of the poems in Always Now having been considered and reconsidered, and small corrections having been made, the book contains definitively all of the published poems up to 2002 that Margaret Avison wishes to preserve.